Note: all recipes serve 6 unless otherwise specified. Prep Day Directions:	Cook potatoes. Put cooked potatoes, onions and peppers in one bag. Sausage in another bag. Serve Day Directions: Thaw in fridge. Heat until meat is cooked and potato/pepper/onion is heated with one tablespoon of olive oil. Prep Day Directions	Combine all ingredients in freezer bag and freeze. Serve Day Directions	To serve thaw completely in refrigerator and cook in crock pot on low for 6-8 hours. On the stove bring to boil and then reduce heat to simmer for 30-45 minutes until vegetables are cooked through. Now if you want you stew thicker, use the 2 Tbsp cornstarch and mix it with 2 Tbsp cold water and add it to the cooked stew. On the stove top, just cook until thick. For the crock pot, turn it on high and cook for 30 more minutes. Serve in large bowls with bread for dipping. butter, mix well. Place meat flat in bag and freeze, wrap butter in tinfoil, freeze. 160. After pork is cooked add a spoonful of butter on each chop. Prep Day Directions: Preheat oven to 400 degrees. Brush each of two rimmed baking sheets with 1/2 tablespoon oil. Place fillets on sheets; season with salt and pepper. Roast until cooked through – 10 to 15 minutes. Let cool completely; pat dry with paper towel. With a fork, flake fish into small pieces. Add’l Prep Day Directions: In large bowl, combine eggs, mayo, parsley, lemon juice, and horseradish. Fold in fish and 1/2 cup cracker crumbs; season with salt and pepper. Place remaining 1 cup crumbs on a plate. Form 16 cakes, using about 1/4 cup fish mixture for each. Gently dredge cakes in crumbs, pressing to help adhere. To freeze, place cakes on baking sheet lined with parchment until firm. Wrap each in plastic and transfer to resealable freezer bags. Serve Day Directions: Thaw overnight in refrigerator. Heat 1 tablespoon of oil in a large skillet over medium heat. Place 6 cakes in skillets; cook until golden brown, 4 to 6 minutes per side. Repeat with remaining cakes and oil. Serve with tartar sauce if desired. Prep Day Directions: In a large bowl, stir eggs, garlic, 2 tsp salt, and 1 tsp pepper to blend. Mix in 2/3 cup marinara sauce, basil, Parmesan, onion and panko. Add beef and blend well. Put in gallon sized freezer bag. Put 2 cups marinara and 1 cup shredded mozzarella into freezer bags. Serve Day Directions: Thaw ingredients Preheat oven to 375 Mound meatloaf mixture on a large rimmed baking sheet; press out to 12×8 inch rectangle (about 1 inch thick). Spread 1/2 cup sauce thinly over the top. Bake meatloaf until cooked through and instant read thermometer registers 160F, 25 to 30 minutes (there will be lots of juices and drippings on sheet around loaf). Cut the meatloaf into eight 4-inch squares and separate the squares slightly. On each square, spread 2 generous tablespoons sauce, leaving a border of meat visible. Sprinkle 1 Tbspof mozzarella cheese in center of sauce. Return meatloaf to oven. Bake until the cheese melts, about 5 minutes. Prep Day Directions: Cook bacon in skillet until lightly brown. Add onion and garlic; saute’ until tender. Stir in soy sauce, lemon juice, honey, curry powder, chili powder and salt. Simmer 2-3 minutes. Remove from heat. Allow sauce to stand for 1 hour until flavors are blended. Place pork chops in freezer bag and add sauce. Serve Day Directions: Thaw Completely. Drain pork chops and save marinade. Place chops on broiling pan and place in oven, 4 inches from heat. Broil 10-12 flip and broil 10-15 or until desired doneness. Brush chops frequently with marinade. Pork chops may also be grilled. Prep Day Directions: Start by seasoning the chicken breasts with some kosher salt. Next sprinkle them on both sides with some coriander and cumin. Then coat the chicken breasts completely with the plain yogurt. Set the chicken on a metal cooling rack over a foil-lined baking sheet and place it about 10-12 inches below a broiler for 5-7 minutes per side. Watch carefully so as not to totally char the chicken. It should have slightly blackened edges. Remove from oven. Next dice one large onion. In a large skillet melt 2 tablespoons butter over medium-high heat. Toss in the onions and sauté until they are slightly browned. As the onions cook, mince your garlic. Next, cut off the outer skin and mince or grate a 1 by 2 inch chunk of fresh ginger. Add the garlic and ginger to the onions. Also throw in about 1 tablespoon of salt. Next you are going to add about 3 tablespoons Garam Masala spice. And if you like it hot, this is also when you will add your hot chili peppers. Serranos work well. Now you are going to add your can of diced tomatoes. Continue cooking and stirring, scraping the bottom of the pan to deglaze it. Add about 1 tablespoon sugar. Let this mixture simmer on medium for about 5 minutes. Add’l Prep Day Directions: After the Tikka Masala sauce has had a chance to simmer for a little bit, add in the 1 ½ cups of heavy cream. 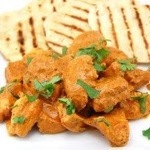 Now, chop up your chicken breasts into chunks and stir them into the Tikka Masala sauce. Place 3 cups of rice butter and turmeric into a bog. Place tikka masala in freezer bags and freeze. Serve Day Directions: Thaw chicken overnight in refrigerator. 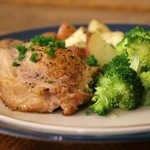 Place chicken breasts in a Pyrex dish and salt and pepper the breasts to your liking. Bake at 350 for 20-25 minutes uncovered. Meanwhile, cook the Spanish rice. Crush some tortilla chips and make a small “bed” of it on a plate. Place breast on top of chips. Spread some of the ranch/taco sauce mixture on top of the breast and then top with a few scoops of Ro-Tel (room temp). Enjoy with a side of Spanish rice! *I was originally going to make my own Pico de Gallo but I found the can of Ro-Tel and it’s basically the same thing. Prep Day Directions: Place tomatoes, green salsa, black beans, pinto beans, and corn in Gallon Freezer bag. Add taco seasoning, cilantro, chile powder, and cumin over the mixture. Mix, label as #1 and freeze. Place cream cheese in qt. freezer bag Place the chicken breast pieces into a Qt. Freezer Bag. Place 2 and 3 in Gallon bag labeled #2. Add’l Prep Day Directions: FYI This recipe calls for additional spice, up to 2 tsp of chili powder. I used 1/2 tsp, so if your family wants more of a kick add to your liking. I used dried beans, soaked and cooked, in place of canned beans, for a decreased salt option. Recipe serves 8. I didn’t decrease due to the simplicity of measuring. Plan for leftovers. I’m sure it freezes well even after cooked. Serve Day Directions: Place Bag #1: Beans, tomatoes, seasoning and the bag of Chicken in cooker, mix and set on Low. Cook until chicken is very tender, 8 to 10 hours. Add the cream cheese into the cooker. Mix to melt and combine to make a creamy sauce. Continue to cook, about 5 minutes, until heated through, then serve. May top with additional cilantro.